A rare type of pancreatic cancer begins in the cells that make insulin and other hormones. Cancer that begins in these cells is called islet cell cancer. This booklet does not deal with this rare disease. The Cancer Information Service can provide information about islet cell cancer. 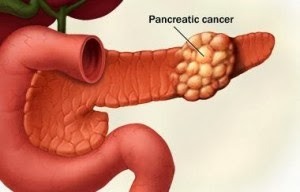 Cancers that develop within the pancreas fall into two major categories: (1) cancers of the endocrine pancreas (the part that makes insulin and other hormones) are called "islet cell" or "pancreatic neuroendocrine" cancers and (2) cancers of the exocrine pancreas (the part that makes enzymes). Islet cell cancers are rare and typically grow slowly compared to exocrine pancreatic cancers. Islet cell tumors often release hormones into the bloodstream and are further characterized by the hormones they produce (insulin, glucagon, gastrin, or other hormones). Cancers of the exocrine pancreas develop from the cells that line the system of ducts that deliver enzymes to the small intestine and are commonly referred to as pancreatic adenocarcinomas. Adenocarcinoma of the pancreas comprises 95% of all pancreatic ductal cancers and is the subject of this review. Cells that line the ducts in the exocrine pancreas divide more rapidly than the tissues that surround them. For reasons that we do not understand, these cells can make a mistake when they copy their DNA as they are reproducing to replace other cells. In this manner, an abnormal cell can be made. When an abnormal ductal cell begins to divide in an unregulated way, a growth can form that is made up of abnormal looking and functioning cells. The abnormal changes that can be recognized under the microscope are called "dysplasia." Often, dysplastic cells can undergo additional genetic mistakes over time and become even more abnormal. If these dysplastic cells invade through the walls of the duct from which they arise into the surrounding tissue, the dysplasia has become a malignant tumor (cancer). The likelihood of developing pancreatic cancer increases with age. Most pancreatic cancers occur in people over the age of 60. Pancreatic cancer occurs more often in people who have diabetes than in people who do not. African Americans are more likely than Asians, Hispanics, or whites to get pancreatic cancer. The risk for developing pancreatic cancer triples if a person's mother, father, sister, or brother had the disease. Also, a family history of colon or ovarian cancer increases the risk of pancreatic cancer. Chronic pancreatitis is a painful condition of the pancreas. Some evidence suggests that chronic pancreatitis may increase the risk of pancreatic cancer. What are the symptoms and signs of pancreatic cancer? The doctor examines the skin and eyes for signs of jaundice. The doctor then feels the abdomen to check for changes in the area near the pancreas, liver, and gallbladder. The doctor also checks for ascites, an abnormal buildup of fluid in the abdomen. The doctor may take blood, urine, and stool samples to check for bilirubin and other substances. Bilirubin is a substance that passes from the liver to the gallbladder to the intestine. If the common bile duct is blocked by a tumor, the bilirubin cannot pass through normally. Blockage may cause the level of bilirubin in the blood, stool, or urine to become very high. High bilirubin levels can result from cancer or from noncancerous conditions. An x-ray machine linked to a computer takes a series of detailed pictures. The x-ray machine is shaped like a donut with a large hole. The patient lies on a bed that passes through the hole. As the bed moves slowly through the hole, the machine takes many x-rays. The computer puts the x-rays together to create pictures of the pancreas and other organs and blood vessels in the abdomen. The ultrasound device uses sound waves that cannot be heard by humans. The sound waves produce a pattern of echoes as they bounce off internal organs. The echoes create a picture of the pancreas and other organs inside the abdomen. The echoes from tumors are different from echoes made by healthy tissues. Transabdominal ultrasound: To make images of the pancreas, the doctor places the ultrasound device on the abdomen and slowly moves it around. EUS (Endoscopic ultrasound): The doctor passes a thin, lighted tube (endoscope) through the patient's mouth and stomach, down into the first part of the small intestine. At the tip of the endoscope is an ultrasound device. The doctor slowly withdraws the endoscope from the intestine toward the stomach to make images of the pancreas and surrounding organs and tissues. The doctor passes an endoscope through the patient's mouth and stomach, down into the first part of the small intestine. The doctor slips a smaller tube (catheter) through the endoscope into the bile ducts and pancreatic ducts. After injecting dye through the catheter into the ducts, the doctor takes x-ray pictures. The x-rays can show whether the ducts are narrowed or blocked by a tumor or other condition. A dye is injected through a thin needle inserted through the skin into the liver. Unless there is a blockage, the dye should move freely through the bile ducts. The dye makes the bile ducts show up on x-ray pictures. From the pictures, the doctor can tell whether there is a blockage from a tumor or other condition. In some cases, the doctor may remove tissue. A pathologist then uses a microscope to look for cancer cells in the tissue. The doctor may obtain tissue in several ways. One way is by inserting a needle into the pancreas to remove cells. This is called fine-needle aspiration. The doctor uses x-ray or ultrasound to guide the needle. Sometimes the doctor obtains a sample of tissue during EUS or ERCP. Another way is to open the abdomen during an operation. When pancreatic cancer is diagnosed, the doctor needs to know the stage, or extent, of the disease to plan the best treatment for pancreatic cancer. Staging is a careful attempt to find out the size of the tumor in the pancreas, whether the cancer has spread, and if so, to what parts of the body. Many people with pancreatic cancer want to take an active part in making decisions about their medical care. They want to learn all they can about their disease and their choices for pancreatic cancer treatment. However, the shock and stress that people may feel after a diagnosis of cancer can make it hard for them to think of everything they want to ask the doctor. Often it helps to make a list of questions before an appointment. To help remember what the doctor says, patients may take notes or ask whether they may use a tape recorder. Some patients also want to have a family member or friend with them when they talk to the doctor-to take part in the discussion, to take notes, or just to listen. Cancer of the pancreas is very hard to control with current treatments. For that reason, many doctors encourage patients with this disease to consider taking part in a clinical trial. Clinical trials are an important option for people with all stages of pancreatic cancer. At this time, pancreatic cancer can be cured only when it is found at an early stage, before it has spread. However, other treatments may be able to control the disease and help patients live longer and feel better. When a cure or control of the disease is not possible, some patients and their doctors choose palliative therapy. Palliative therapy aims to improve quality of life by controlling pain and other problems caused by this disease. The doctor may refer patients to an oncologist, a doctor who specializes in treating cancer, or patients may ask for a referral. Specialists who treat pancreatic cancer include surgeons, medical oncologists, and radiation oncologists. Treatment generally begins within a few weeks after the diagnosis. There will be time for patients to talk with the doctor about treatment choices, get a second opinion, and learn more about the disease. At this time there is no known surveillance strategy to reduce the risk of pancreatic cancer for the general population. With only 40,000 new diagnoses a year occurring in a country with over 300 million people, screening blood tests or X-rays have never been proven to be cost effective or beneficial. Additionally, doctors do not routinely screen individuals with family members diagnosed with the disease aside from the rare instance where a known genetic risk factor is present. The doctor can describe treatment choices and discuss the results expected with each pancreatic cancer treatment option. The doctor and patient can work together to develop a treatment plan that fits the patient's needs. Treatment depends on where in the pancreas the tumor started and whether the disease has spread. When planning treatment, the doctor also considers other factors, including the patient's age and general health. Where in the pancreas did the cancer start? Do I need any more tests to check whether the disease has spread? The side effects of surgery depend on the extent of the operation, the person's general health, and other factors. Most patients have pain for the first few days after surgery. Pain can be controlled with medicine, and patients should discuss pain relief with the doctor or nurse. Patients may not have enough pancreatic enzymes or hormones after surgery. Those who do not have enough insulin may develop diabetes. The doctor can give the patient insulin, other hormones, and enzymes. If a pancreatic cancer is found when it has grown into important local structures but not yet spread to distant sites, this is described as locally advanced, unresectable pancreatic cancer (stage III). The standard of care in the United States for the treatment of locally advanced cancer is a combination of low-dose chemotherapy given simultaneously with radiation treatments to the pancreas and surrounding tissues. Radiation treatments are designed to lower the risk of local growth of the cancer, thereby minimizing the symptoms that local progression causes (back or belly pain, nausea, loss of appetite, intestinal blockage, jaundice). Radiation treatments are typically given Monday through Friday for about 5 weeks. Chemotherapy given concurrently (at the same time) may improve the effectiveness of the radiation and may lower the risk for cancer spread outside the area where the radiation is delivered. When the radiation is completed and the patient has recovered, more chemotherapy often is recommended. Recently, newer forms of radiation delivery (stereotactic radiosurgery, gamma knife radiation, cyber knife radiation) have been utilized in locally advanced pancreatic cancer with varying degrees of success, but these treatments can be more toxic and are, for now, largely experimental. What is the treatment for metastatic pancreatic cancer? Once a pancreatic cancer has spread beyond the vicinity of the pancreas and involves other organs, it has become a problem through the system. As a result, a systemic treatment is most appropriate and chemotherapy is recommended. Chemotherapy travels through the bloodstream and goes anywhere the blood flows and, as such, treats most of the body. It can attack a cancer that has spread through the body wherever it is found. In metastatic pancreatic cancer, chemotherapy is recommended for individuals well enough to receive it. It has been proven to both extend the lives of patients with pancreatic cancer and to improve their quality of life. These benefits are documented, but unfortunately the overall benefit from chemotherapy in pancreatic cancer treatment is modest and chemotherapy prolongs life for the average patient by only a few months. Chemotherapy options for patients with pancreatic cancer vary from treatment with a single chemotherapy agent to treatment with as many as three chemotherapies given together. The aggressiveness of the treatment is determined by the cancer doctor (medical oncologist) and by the overall health and strength of the individual patient. Pain is a common problem for people with pancreatic cancer. The tumor can cause pain by pressing against nerves and other organs. Radiation - High-energy rays can help relieve pain by shrinking the tumor. Nerve block - The doctor may inject alcohol into the area around certain nerves in the abdomen to block the feeling of pain. Surgery -The surgeon may cut certain nerves to block pain. The doctor may suggest other ways to relieve or reduce pain. For example, massage, acupuncture, or acupressure may be used along with other approaches to help relieve pain. Also, the patient may learn relaxation techniques such as listening to slow music or breathing slowly and comfortably. People with pancreatic cancer may not feel like eating, especially if they are uncomfortable or tired. Also, the side effects of treatment such as poor appetite, nausea, or vomiting can make eating difficult. Foods may taste different. Nevertheless, patients should try to get enough calories and protein to control weight loss, maintain strength, and promote healing. Also, eating well often helps people with cancer feel better and have more energy. Careful planning and checkups are important. Cancer of the pancreas and its treatment may make it hard for patients to digest food and maintain the proper blood sugar level. The doctor will check the patient for weight loss, weakness, and lack of energy. Patients may need to take medicines to replace the enzymes and hormones made by the pancreas. The doctor will watch the patient closely and adjust the doses of these medicines. The doctor, dietitian, or other health care provider can advise patients about ways to maintain a healthy diet. Living with a serious disease such as pancreatic cancer is not easy. Some people find they need help coping with the emotional and practical aspects of their disease. Support groups can help. In these groups, patients or their family members get together to share what they have learned about coping with their disease and the effects of treatment. Patients may want to talk with a member of their health care team about finding a support group. People living with pancreatic cancer may worry about the future. They may worry about caring for themselves or their families, keeping their jobs, or continuing daily activities. Concerns about treatments and managing side effects, hospital stays, and medical bills are also common. Doctors, nurses, and other members of the health care team can answer questions about treatment, diet, working, or other matters. Meeting with a social worker, counselor, or member of the clergy can be helpful to those who want to talk about their feelings or discuss their concerns. Often, a social worker can suggest resources for financial aid, transportation, home care, emotional support, or other services.